The Commonwealth Association of Surveying and Land Economy (CASLE), Golden Jubilee Year is in 2019. Accordingly, members of the Management Board of CASLE invited Dr D Dumashie, Vice President FIG to join them at their event to launch their Golden Jubilee Year combined with an interactive strategy working group session. 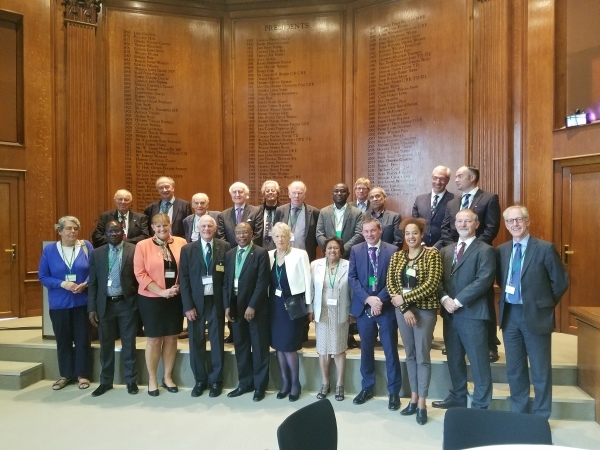 The Commonwealth Association of Surveying and Land Economy (CASLE) holds a long standing relationship with FIG, and because of our past consistent mutual support with each other’s activities as well as sharing platforms at the UN agencies, attending such an important workshop importantly continues our strategic partnership relationship. After a positive and thought provoking welcome address from Mr Joseph Olusegun Ajanlekoko, President of CASLE, a buffet lunch was served, and followed by a presentation by Louise Brook Smith (Past President RICS). The day progressed under the banner of ‘CASLE – the future in a post Brexit world’ with workshop style discussions focussing on new ideas for the ongoing strategic development of CASLE. The outcomes of which will be considered and further developed by the Management Board. CASLE was founded in 1969, inspired by the Commonwealth Foundation to assist specifically in the development of skills in surveying and land economy. Like FIG, CASLE is an accredited NGO with a UN agency, in this case, it has Special Consultative Status with Economic and Social Council of the UN (UNESCO). Consequently many of FIG focus areas, particularly in Commission 7, 8, 9 and 10 have cross over links, thereby facilitating the cooperation in the past and onwards into the future. FIG members look forward to continuing engagement with CASLE.